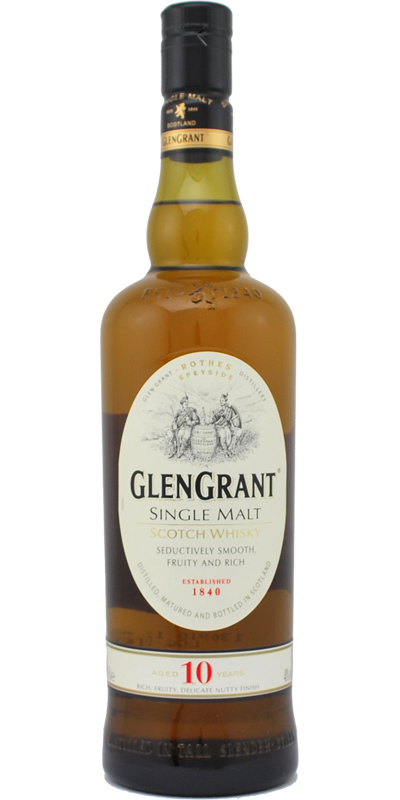 Older, independently bottled Glen Grants can be of exceptional quality after having slept in oak barrels for a few decades. This 10-year-old expression, however, is a very simple and undemanding Speyside Single Malt. The aroma is understated, sweet and fruity with hints of pears, nuts and fresh hay. Spicy, young and spirity in the arrival, there are notes of lemon juice, red currants and honey before dry refill cask bitterness takes over. Wood tannins and faint vanilla characterize the rather short finish. A cheap beginners whisky without any complexity. This whisky is not bad. In his way he is almost perfect. Only he is pretty boring. I think that's the most boring single malt I've ever had. The small "Major's Reserve" is a composite of joie de vivre and character compared to this one. Sweet, mild, soft, pear and caramel. In the mouth then caramel, sweet fruit notes and some wood. Sweet finish with caramel and oak. A pretty round, but good all-day Speysider. An easy to enjoy, uncomplicated malt. It's a bit young without being immature. The smells and tastes are enjoyable, but brief and fleeting. Creamy candied lemon peel and sweet osmanthus blossoms, light malt with a faint black pepper and menthol note, light vanilla and caramel, fresh plums and guava, and a touch of almond fading into the alcohol burn. Mocha and creamy raspberry liqueur , a touch of caramel, baked vanilla custard, candied orange peel, light floral honey and black pepper, and wave of fresh plums and apple liqueur. Dark chocolate and coffee, bittersweet floral (osmanthus), and drying oak tannins mixed with a very faint bitter-almond-esque maltiness. Absolutely nothing is outstanding about this dram. It doesn't give you much, but it's not half bad. Very tame. Very good daily dram, goes down really easily. Great price-quality ratio.